Despite allegations of corruption and irregularities in the Sri Lankan Airlines handling of a 330 deal with PIA, the government has decided to grant approval for Sri Lankan airlines to extend the three A330-320 leasing deal with a European company as the matter is now in international commercial courts. A case was filed in the Commercial High Court of Justice earlier this month by SASOF II Aviation Ireland Ltd pleading the judiciary to declare that SriLankan Airlines is abide by the relevant extension agreements. This company is also seeking an order to recover all rental payments due to them under the extended leases and costs. Under these circumstances, a top level government committee has decided to direct the Sri Lankan Airlines to extend the lease agreement although the Board of directors of the airline is divided on the issue. However a high level team is probing as to how the Sri Lankan Airlines CEO has extended the leases last year without a Sri Lankan airlines board decision and other mal practices connected to the deal. 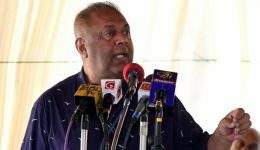 But the Minister of special assignments Dr. Sarath Amunugama was of the view that the extending of the lease agreement was the only viable solution to maximize earnings of the airline. Meanwhile a high level investigation has been instigated by the government to ascertain corrupt practices and administrative blunders if there are any in the Sri Lankan Airlines A-330 air craft dry lease to the Pakistan International Airlines (PIA) in August last year and their lease of three A330-200 aircraft from an international firm in 2010, official sources said. A team of high ranking officials has been directed to conduct an in-depth investigations in to theses deals and submit a report with recommendations and cause of action against the top officials Including the CEO of the airline if they found guilty for causing a massive financial loss for the country. Sri Lankan Airline is yet to collect US$2 million plus interest from PIA following the ending of the dry lease after three months of operation. Bernd Hildenbrand, the German head of Pakistan International Airlines Corp. (PIA), has been put on a so-called exit control list (ECL) and the nation’s anti-graft Federal Investigation Agency has been directed to probe the national carrier’s wet lease of A 330 Aircraft allegedly tainted with corruption and irregularities, Pakistan media reported.